Rheumatoid arthritis is a chronic and inflammatory autoimmune disease that usually affects the small joints all over the body. The disease causes inflammation of the joints, which with time get swollen and stiff, causing pain. If the disease is not diagnosed and treated on time, it can affect not only the joints but also the surrounding components of the bones, completely destroying the area beyond the joints. Family history – rheumatoid arthritis tends to run in the families. Having a family member suffering from rheumatoid arthritis increases the risk of the disease. 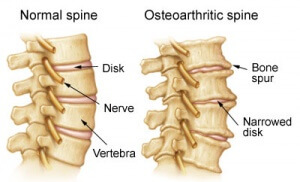 Rheumatoid arthritis affects also the cervical part of the spine causing back pain. Once the cervical spine is affected it will cause various signs and symptoms. The earliest symptom is pain, which results from the overall joint inflammation. As the diseases progresses, the signs and symptoms tend to get worse. Except pain, there is also stiffness of the neck, making it difficult to move the neck in different positions. The inflammatory process can cause cervical subluxation of the neck, which leads to spinal cord compression. The compression of the spinal nerves leaves to sensation problems, muscle weakness, breathing problems, etc. Changes in the bowel or bladder control can also occur, leading to bladder or bowel incontinence. The signs and symptoms of rheumatoid arthritis vary in severity. The periods of active disease are altered with the periods of relative remission. The diagnosis of rheumatoid arthritis of the cervical spine begins with a complete medical history and physical examination. It is very important to know and determine when the signs and symptoms have started, if they tend to get worse or not, what makes them worse and what makes them better, etc. No laboratory tests will help diagnose this medical disease, but X-rays of the cervical spine, MRI and CT-scans help your health care provider find the right diagnosis. As rheumatoid arthritis is a chronic inflammatory disease it has no treatment. However, the goal of the treatment is to relieve its signs and symptoms as well as to prevent further damage and progression of the arthritis. Pain is controlled with the help of: Nonsteroidal anti-inflammatory drugs (NSAIDs), Corticosteroids and disease-modifying antirheumatic drugs (DMARDs). Cervical Epidural Steroid Injections might be used to control pain. If you experience arthritis of the cervical spine pain and haven’t found lasting relief through more conventional arthritis of the cervical spine pain treatments, medical marijuana treatments offered by our doctors may be right for you. Call medical marijuana doctors of Pain Physicians NY with locations in Brooklyn, Queens, Manhattan and Bronx NYC to help you determine if medical marijuana treatment is right for your arthritis of the cervical spine pain. Physical therapy and various exercises play a great part in the treatment, as they tend to strengthen the muscles of the neck, shoulders and back, maintain the flexibility and stability of the spine as well as improving the balance.